I remembered reading about this one time, but I totally forgot until now. Ladies and gents, I am going to make a treadmill desk. 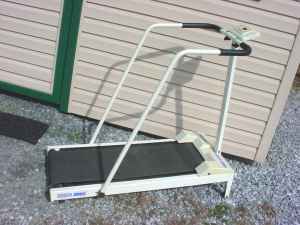 I found a $25 manual treadmill on Craigslist. I will probably pick it up tomorrow. See where it levels off? That is where the desk portion will be. Awesomesauce! I can now do two of my favorite things: walk/run while browsing the internet or programming! If you can get it work well I might have to steal your idea. It shouldn't be too hard. Check out the other blog I linked to, there are links to other treadesks(I just made that word up). Hmm interesting.. I wonder how many words per min could I type while running a 7.5mph? Haha I'll try it when I make it. Hopefully it will be later on this week. In fact, I'll write a whole blog post while running on the treadmill without edits. I have dyslexic fingers, so adding running to that should make it pretty cryptic. I am unsure about the manual aspect of the treadmill. It seems those that use them have really bad stability. I am pretty inventive, so maybe I can muster something up that will stabilize. You might well have problems with the manual treadmill! I tried it for awhile but never could get a good balance between pushing forward into the desk and sliding off the back if there was too much tilt.